« What’s the deal, Amazon? I’d like to start a new, short series on IT staffing, looking at the issues from a slightly different angle. We’ll start with the typical IT shop. It may be the kind that Nicholas Carr suggested will go away, but right now, it’s likely the most familiar to you and me. Yes, I know, it looks all over the map, but that’s okay. The up-and-down motion you see above corresponds to a natural cycle of projects — starting off with a few key people making planning, then leading to a ramp-up in staff to do the work. As the go-live approaches, the technical staff begin to slowly trail off, until, eventually, we only have a few people left to keep the lights on. Then some executive gets a new idea, and the cycle begins anew. Of course, this assumes one project at a time. Most larger organizations have multiple projects, dozens of projects, hundreds of projects at a time, each with an ebb and flow. The company may have a portfolio management organization, or PMO, who’s only job is to keep straight the staffing and skills needs, and try to keep the company running at 100% capacity. That said, no matter how hard they try, I find organizations have this kind of natural ebb and flow. Until they understand the flow, in my experience, companies tend to think about hiring in one of two ways. They can either peg hiring to the minimal needs, or to the maximal needs. 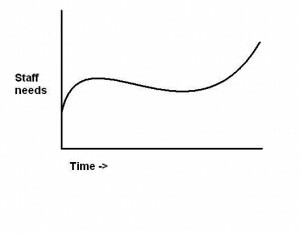 Hiring to the min, or ‘below the line’, means drawing a line at the bottom of the demand curve. This guarantees you’ll never have excess capacity. It’s also cheap — at least, cheap in the short run. Companies that hire this way simply can not accomplish the goals they set, thus the products are late and buggy, the customers unhappy, the sales goals unmet … so next year, there won’t be money for additional staff. We can all guess how this turns out. The obvious alternative to hiring below the line is to hire above it. Believe it or not, some companies actually do this. The blue in the picture above is waste — or at least, undirected team capacity. While some companies like Google embrace ideas like 20% time, the fact is that much blue will make many a CEO wince. There are some rare companies at a place in the growth cycle where they are constrained by people, but by money; where the company can throw a hundred thousand dollars at people and get two hundred thousand back from the marketplace. So this strategy might just work for Google in 2008, Groupon in 2009, or AirBnB in 2010. For the rest of us, though, it seems unlikely. The “classic” HR solution to this problem is staff permanent employees to the bottom line, but fill in the red with contractors, temps, staffing agencies, and ‘partner’ organizations. Now we could talk about the true cost of ramp-up for contractors, but, for now, let’s assume that strategy works. Do you want to be a red person or a blue person? It may sound like a silly question, but there’s a method here. Think on it: The blue people (for lack of a better term), are the people above the sliced line. They will be creating new systems, setting up servers, creating policies, adding new capacity, teaching to fish. These people are, to borrow a phrase, the pioneers. To blue people, projects are “new every morning”, and, to be clear, risk and change are just a part of life. The red people — the ones below the minimal staffing line — are operational people. They come in, know what they have to do, do it well, and expect a paycheck and some permanence. The red people are farmers, creating accounts, resetting up passwords, troubleshooting, doing predictable, well-defined work. Note that I’m not talking about personal politics, or the details of your organization. Yes, it is possible that your boss likes you because you are willing to dive into new technologies, and that gives you job security. Instead, I’m talking about the personality types that will tend to fit into different roles if companies take this approach. And mind you, they are taking this approach. If you know which type you’d rather been, you can steer your career in that direction. If you don’t steer, you’ll likely end up wherever someone else, some levels of the chain above, decides you ought to be.